A third memoir from the author of the huge international bestsellers Angela's Ashes and 'Tis. 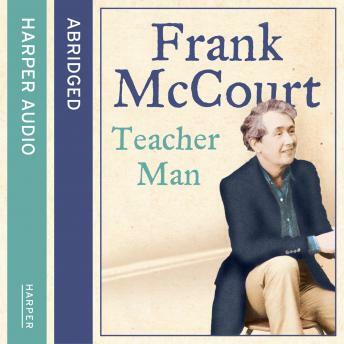 In Teacher Man, Frank McCourt reads his own account of his illustrious, amusing, and sometimes rather bumpy long years as an English teacher in the public high schools of New York City. Frank McCourt arrived in New York as a young, impoverished and idealistic Irish boy - but who crucially had an American passport, having been born in Brooklyn. He didn't know what he wanted except to stop being hungry and to better himself. On the subway he watched students carrying books. He saw how they read and underlined and wrote things in the margin and he liked the look of this very much. He joined the New York Public Library and every night when he came back from his hotel work he would sit up reading the great novels. The New York high school is a restless, noisy and unpredictable place and Frank believes that it was his attempts to control and cajole these thousands of children into learning and achieving something for themselves that turned him into a writer. At least once a day someone would put up their hand and shout 'Mr. McCourt, Mr. McCourt, tell us about Ireland, tell us about how poor you were...' Through sharing his own life with these kids he learnt the power of narrative storytelling, and out of the invaluable experience of holding 12,000 people's attention came Angela's Ashes. Frank McCourt was a legend in such schools as Stuyvesant high school - long before he became the figure he is now he would receive letters from former students telling him how much his teaching influenced and inspired them - and now in Teacher Man he will share his reminiscences of those 30 years as well as revealing how they led to his own success with Angela's Ashes and 'Tis.